What is it about a frosted cookie that makes kids go gaga? I think I could serve Chloe a mud biscuit and if there was icing on it I guarantee she would eat it. But since I'm not in the habit of serving my kids mud (at least not regularly), I've been making these Lemon Poppy Seed Cookies as a special treat. A lot cheaper then the iced cookies sold in the bakery at our local grocery, they're also made with better ingredients than what you will likely find in the pre-packaged varieties. They're soft and sweet with tiny pieces of lemon zest and poppy seeds speckled throughout -- my kids say they look like tiny spots. Keep a batch of this dough in the fridge and you can quickly roll it out whenever the kids come home from school and you want to bake them a special treat. Frosted or not, these cookies are beyond delicious (though to be clear, Chloe prefers them with icing!). 2. In a bowl, whisk together the flour, baking powder, salt, and poppy seeds. 3. In the bowl of a standing mixer (or using an electric mixer) cream together the butter and sugar for 3 minutes on medium to high speed, or until light and fluffy. 4. Add the egg, vanilla, and lemon zest and beat until just incorporated. 5. Turn the speed to low and slowly add the flour mixture until the dough comes together. 6. Using a lightly floured rolling pin, roll out the dough onto a lightly floured surface until 1/4\" thick and even. 7. 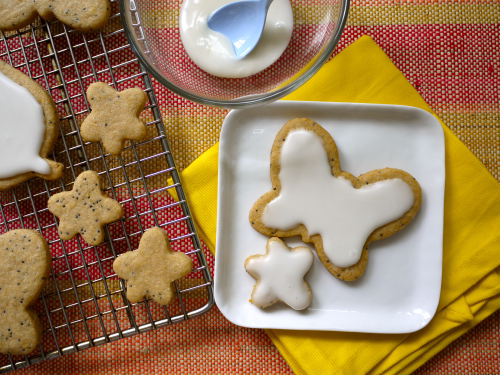 Use cookie cutters to cut out desired shapes (I like to start at one end of the dough and make the cuts close together to utilize all of the dough). 8. Using a spatula, transfer the cut-outs onto a Silpat or parchment-lined cookie sheet. 9. Bake for 15 minutes, rotating the tray from back to front halfway through cooking until the edges just turn golden. 10. Cool cookies on a rack. 11. To make the icing, stir together the lemon juice and powdered sugar until smooth and ice the cooled cookies. Made these last week! Everyone loved them! I did add a little more zest and juice since I can't get enough of lemon! Is there anyway to cut some of the sugar down or to use agave, applesauce or honey instead. Would it make them taste horrible? You can take out the sugar and use 1/3-1/2 cup of honey or agave. Start with the lesser amount and add more to get to a dough consistency! I will change the flavor and texture a bit. My husband and I have made these a few times - but we're wondering what we're doing wrong with the icing. We're following the recipe, but it seems pretty runny. They still taste great, but we're wondering if there's a trick to making the icing thicker. Thanks! This icing can really be customized to whatever thickness you want it. Just use more powdered sugar or less liquid until you reach your desired consistency!